sparkle wheels: What about the Superhumans? Yesterday, I had an interesting discussion with my friend, and fellow Disability Studies academic, Louise Hickman about the Paralympics in general and about Channel 4's 'Meet the Superhumans' advert for the Paralympics, which you can watch here. It has inspired (no pun intended) me to write down my thoughts about the advert. First of all, I like the ad, for the simple reason that I think it does what it should do, without grossly offending anyone. 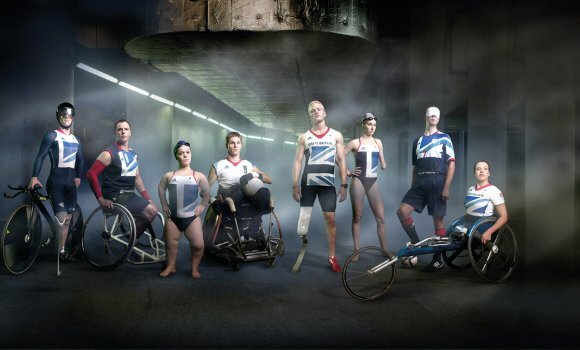 It does make the Paralympics seem cool, fresh and interesting. The two main attributes of the video that make this happen are the music, and the scene with the pregnant mother, the car crash and the war scene. Because the music works. It is exciting and energetic, and provides a great rhythm for the video. It makes you move and it makes you want to be involved with what's on the telly. Also, I think the main goal of the video was to make non-disabled people buy a ticket for the Paralympics. In a day and age, when Blogger still highlights the word 'Paralympics' for me, because apparently it is not a real word, and maybe I meant 'Paralytics' instead, that's a reasonable goal, in my book. It is a shame that disabled musicians are vastly underrepresented in the charts, and I do hope Channel 4 will do their bit to include Disability Arts alongside their Paralympics coverage, but for this video, the track works perfectly. It seems like they wanted to use a well-known artist that is liked by many people and Stevie Wonder probably wasn't available to do a song. So we have some sporty people with amazing bodies, and some good music. A nice video, but not enough to make it all that memorable. Enter the pregnant lady, the war scene and the car crash scene. In the audience that is not aware of most of the discourse around disability, this triggers probably some uncomfortable feelings, which are quickly resolved when the scene is over and the video goes back to showing the athletes, full of energy and life. It can suggest, but only very subtly, the context of disabled people overcoming struggles, being inspiring and all that. It can also suggest that most of those athletes have a human-interest story to tell. Both those things are problematic from a disabled activist point of view, but again, it might be just what it needs to fill those stadium seats. Also, those scenes show disabled people everywhere that while they might not have the gorgeous bodies of the athletes, or their energy, we all have this story in common, and we all have in common that people want to know about it, whether we like it or not. Because the scene does not clearly mark those events - the car crash, the bomb' as horrible or tragic, but just acknowledges that they are part of the story, in my point of view the the video works, with a little bit of goodwill, both for a disabled and a non-disabled audience. At no point the athletes seem to be struggling with their bodies - or at least, not more than any athlete would. Sports on this level always includes a struggle with one's body - the idea, that one has to push their body beyond its limits to achieve things that maybe it was not built for. It doesn't imply that ALL disabled people are superhumans, but that the paralympic athletes are - just like all athletes you've met before you met those superhumans. 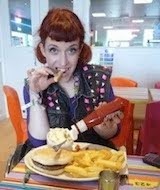 My name is Nina Neon and I am doing a PhD in London. This blog contains my thoughts on disability arts, disabled super humans and disability in the media and arts in general. I might also post some more personal things if I feel like it, because, as you know, sometimes the personal is the political. Drag queens, mermaids or unicorns might feature as well.